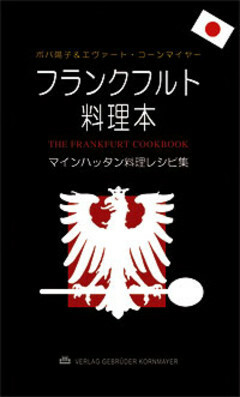 Die besten Frankfurter Rezepte in japanischer Sprache. We can think of no other city that is so well known worldwide as Frankfurt for its Frankfurters. But other tasty specialties got their start here, too: Handkäse mit Musik (a country cheese), Ripchen mit Kraut (cutlet with sauerkraut), Frankfurt Kranz (a cake in the shape of a crown), Frankfurt Brenten (a marzipan confection similar to Bethmännchen which also originated in Frankfurt) and Frankfurt Brühwurst (boiled sausage). However, when one thinks of Frankfurt and food, one immediately thinks of Frankfurt Green Sauce – particularly with boiled potatoes. And truly, when it is well made it is something of a sensation. In this book, you can find inspiration – or better, try out the recipes! You will see, it is not really difficult and it’s fun. And it’s also not forbidden to drink one or three glasses of wine – whether from Frankfurt’s own Lorberg vineyard or from one of its famous apple-wine cellars.